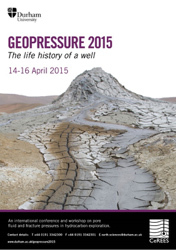 The 2015 Geopressure Conference was held this past April in Durham in the UK (attended by seventy-five organizations including ConocoPhillips, BP, Total, Shell, Hess, Apache, BG, Chevron, ExxonMobil, and HXR) and provided a forum for an open discussion of pore pressure prediction methods. Abstracts are available online at www.durham.ac.uk/geopressure2015. Several participants at the conference presented field data showing clearly that pore pressure in shale increased with depth at a systematic lithostatic rate, below an identified pressure retention depth (RD), in accordance with classical compaction disequilibrium models. Richard Swarbrick (in his talk but not abstract) displayed a hugely useful relationship between sedimentation rate and RD, i.e., the depth at which bound water in shales reaches a critical threshold saturation sufficient to trap overpressures. Expressed in simple form, i.e., PPG=((8.9)(RD)+(DEPTH-RD)(19.25))/DEPTH this model yields an easy-to compute, first approximation for pore pressure gradient in shales below the top of overpressures. In the equation pore pressure gradient (PPG), normal hydrostatic gradient (8.9) and lithostatic gradient (19.25) are in lbs/gal; and, DEPTH (kb-tvd) and RD are in any set of units, e.g. meters or feet. Other talks at the conference focused on problematic exceptions to the simple compaction disequilibrium model. Rachael Hutson (BG Group) discussed lateral pressure transfer along dipping horizons that cause pore pressure in permeable cells to not equal that in the bounding shale, i.e., the centroid effect. She presented an automatic 3D identification of seismic geobodies for making centroid corrections. Bing Nguyen (JX Nippon), Peter Andras (Durham University), and others discussed chemical compaction that, above a formation temperature of about 100 degrees Celsius, contributes sharply to the magnitude of overpressures – an effect described as unloading. They discussed a standard density vs. velocity cross-plot method as an identification tool for unloading. Brent Couzens-Schultz (Shell) and others discussed the onerous complications of secondary stress components, e.g., near salt bodies and thrust-faulting regimes. Keith Katahara (Hess) discussed the issue of varying clay content in the petrophysical data set used to predict pore pressure and proposed use of neutron logs to derived clay volume. Much of the discussion included large data sets, e.g., Mark Herkommer (Schlumberger) use of a public domain 14 well data set (available at http://www.dggs.alaska.gov/pubs/id/14788) and Matt Hauser (Shell) use of an in-house data set of 128 leak-off tests from a 600 x 200 mile section in the Gulf of Mexico.